Painted for the sitter and thence by descent to the present owner. Levrac-Tournières went to Paris in the late 1680s, but began his career in earnest in Rigaud's studio at the turn of the century, making copies of the master's compositions; it was there that he perfected his skill as a portrait painter. He was received into the Académie in 1702 as a portraitist and despite his occasional forays into history painting (he was elevated by the Académie to the grade of history painter in 1716), he remained chiefly a portrait painter who exhibited regularly at the Salon. His exceptionally meticulous technique -- Dezallier d'Argenville noted that he sought to imitate the 'beautiful colors, appealing highlights and that perfect finish' of the Dutch masters -- is fully in evidence in the present portraits. It is to Rigaud's art that Tournières is most obviously indebted: from it he learned how to enliven a figure with voluptuous swirls of silk and velvet, and how to endow each sitter with a restrained and aristocratic bearing and striking personal presence. The closely observed play of light in each painting and the confidence and familiarity reflected in the sitters' expressions are Tournières' distinctive contributions to the art of portraiture. 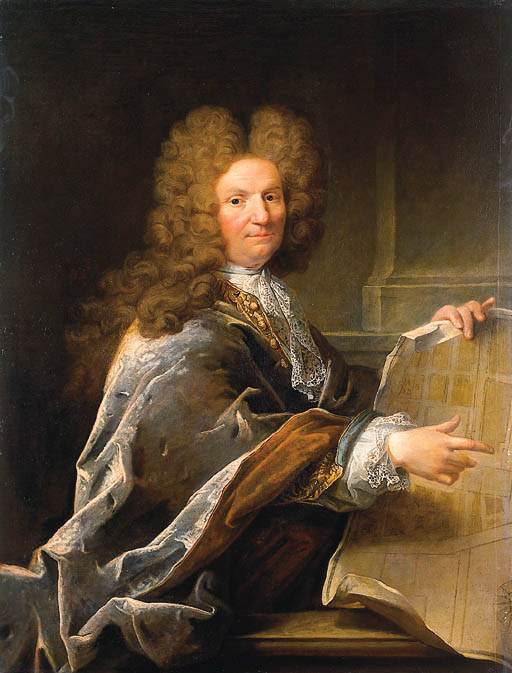 Noël Beaudet de Morlet was ennobled by Louis XIV, having been appointed Hussier Ordinaire de la Chambre du Roi, Conseiller, and Directeur des Pépinières du Roi -- the last an appointment in which he was charged with overseeing the King's seedbeds and plant nurseries. The garden plan that he holds in his portrait no doubt alludes to this role. Beaudet de Morlet was married twice, first in 1685 to Marguerite Gallyot, and then to Marie-Elenore Hersent in 1709. He had five children, all by his first wife, the oldest of whom, Charles-Nicolas, took over the Royal appointments when his father died after 36 years of service to the crown.